At MicksGarage.com we try to provide you with as much information as possible about the products on our site. Here is a list of frequently asked questions about the Seat Covers sold on MicksGarage.com. 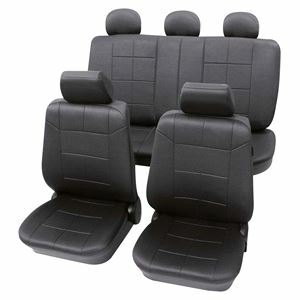 Where can I find Car Seat Covers for my car? Just CLICK HERE, enter your vehicle registration OR vehicle make and model where indicated, and you'll be shown all seat covers to fit your vehicle. Are Car Seat Covers fitted? All Car Seat Covers sold on MicksGarage.com are a universal fit but they have been tested on a wide range of cars to confirm compatibility with each model. Will they fit Sports seats? Simply, no! All Car Seat Covers are made for standard seats only. Sport or bucket style shaped seats will not allow the seat covers to sit correctly and unfortunately aren't compatible with the seat covers sold on MicksGarage.com. Are the designs the same on the back as you see on the front? The Car Seat Covers design will appear on the front section of the cover and the rear section will be plain with no design. Can I buy covers for 7 seaters? Although our seat covers will fit the front 5 seats in a 7 seater vehicle, we unfortunately don't stock seat covers that would fit the rear seats of a 7 seater vehicle. If I do not have head rests will the Seat Covers still fit? Yes. The headrest come as a separate unit, so if your car is not fitted with headrests, the seat covers can still be used and will still fit.